The temperature outside hovers just above freezing. 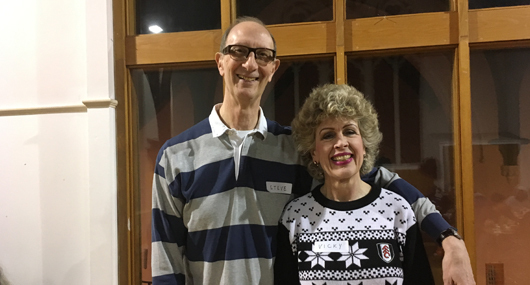 Inside the Rivercourt Methodist Church in West London, people of all ages and nationalities are laughing and chatting over a home-cooked roast chicken dinner. Kwaku Anokye Tieku, the regular organist at the church, plays the piano, accepting requests for everything from Abba to Gershwin by way of Elvis Presley. It would be easy to mistake the scene for a party, but it’s really a homeless shelter that feeds about 60 and provides overnight shelter for 35 individuals who would otherwise be sleeping rough. Every Sunday night for the past 17 winters, Rivercourt Methodist Church has hosted a bustling homeless shelter. Rivercourt Methodist Church is one of 22 different churches in London that work with Glass Door Homeless Charity to run night shelters. On any given night, three churches open their doors, allowing about 95 individuals to find a safe, warm place to sleep every night during the coldest months of the year. The churches in the network, comprised Catholic, Anglican, Baptist and Methodist institutions, take turns hosting shelters seven days a week from early November to April. These churches, and the volunteers involved, are at the heart of the biggest homeless shelter network in the country. This year, over 700 volunteers have registered with the charity and given their time to cook, set up shelters, serve food and clean up. Steve Lawrence, a volunteer coordinator at the Rivercourt Methodist Church, first got involved because “it was something concrete I could do to help,” he says. But I think I continued to carry on volunteering because it’s fun. Steve is quick to give credit to the rest of the “dedicated and talented” volunteer team and his wife and co-coordinator, Vicky, for creating a warm environment full of good humour. The volunteers not only give up their time, but many have raised funds for the charity, taking part or supporting the annual Sleep Out event. Others source food from within the local community. During the day, many of the guests will visit the drop-in centre run by the Chelsea Methodist Church in partnership with Glass Door. There, caseworkers are on hand to help the guests move beyond homelessness. Halfway through the winter season, 22 individuals have been supported into finding work, and 44 individuals have moved into more stable housing. Thank you for all your support, and for giving me food and shelter through a rough time in my life. By 9:30pm, the music and banter have ended, plates have been cleared away, and the 35 overnight guests begin to roll out their sleeping mats under the dark arched beams of the church. Kwaku, Steve, Vicky and the volunteers return to their homes, and those that only come for dinner because the shelter is full slowly peel away, knowing they now need to find a place to rest for the night. Inside the warm church, a couple of Glass Door staff members stay awake to guard over the church and its guests.